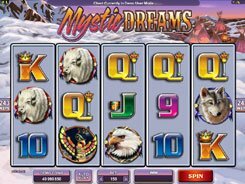 Mystic Dreams is a Native Indian themed slot with 5 reels and 243 ways to win. 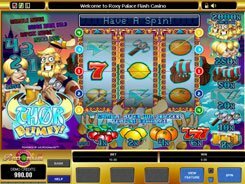 The slot features a wild, a scatter symbol and free spins. A player has two adjustable bet settings: a coin size ($0.01 to $0.2), and the number of coins (up to 5), thus the minimum and maximum bets amount to $0.3 and $30 respectively. Along with standard playing cards, the symbols are Eagle, White Wolf, White Buffalo, Native Indian, Totem Pole and Teepee. 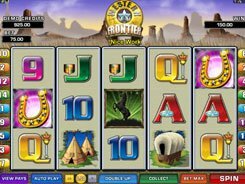 The biggest award worth $45,000 is granted for five scatter symbols, and the second-largest jackpot ($2500) is paid out for hitting five Native Indians on adjacent reels. 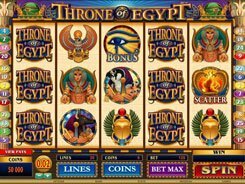 The slot features a wild symbol that can replace for all symbols, including scatters, to create winning combos. 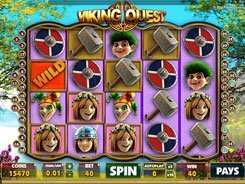 Hitting three or more scatters unlocks you access to 10–20 free spins. 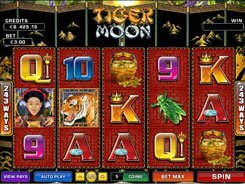 During the free spins all regular wins pay at their nominal paytable values, but if you roll up a wild symbol on reel 2, 3 or 4, the payout for a winning combo (if any) will be multiplied by x2, x3 or x4.